Florida in Spring. This often means windshields covered with yellow pollen, and lots of coughing and sneezing. As hard as I try to combat this with all natural remedies such as essential oils, I still find allergies to be problematic for both myself and my boys. My husband is not plagued as bad as we are, but the rest of us really suffer. Recently Kids Xlear offered to send me their nasal spray and it has really helped my older son. I am unable to get my two year old to try it, but my seven year old has been using this nightly and it has really helped him. I have noticed him with less of a dry cough, less runny nose and itchy eyes in the week since we have been using this. 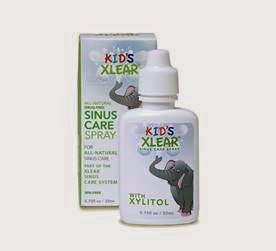 Kids Xlear Nasal Spray to soothe and moisturize the sinus and nasal passages. While other nasal sprays contain chemical antihistamines or decongestants that leave airways dry and vulnerable to external contaminants, Xlear's natural xylitol and saline solution is hyper-osmotic, which draws moisture and keeps the nasal passages moist and clean when your child's allergies act up. Since xylitol is completely natural, there are absolutely no side-effects, making this a safe solution for kids of all ages! Kids Xlear Nasal Spray is available at Whole Foods, Vitamin Shoppe, and online at www.xlear.com. Overall, I am very happy with the product and will continue using it for my son when Spring allergies start to bother him!